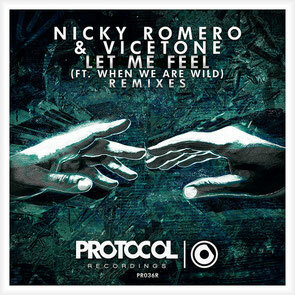 Riding high off the ‘Feet On The Ground’ remix package from 24 November, Nicky Romero’s label Protocol Recordings recently released a collection of remixes for ‘Let Me Feel’, Nicky’s collaborative track with Vicetone and vocalists When We Are Wild. First up, Fedde Le Grand steps up to the plate for remix duties, fully morphing ‘Let Me Feel’ into his own creation by injecting signature thumping kicks and electro stabs into the mix, which is currently streaming on Spotify. Mellowing the vibe with a more euphoric feel, Swedish DJ and producer Manse utilises swirling synth pads and rhythmic tones to create a more ethereal feel for remix number two. Flipping 180 degrees and diving deeper into the dance music spectrum, Martjin ten Velden slows down the original and brings it into a darker atmosphere giving the vocals some room to breathe. Capping the release off, Protocol favourites Volt and State bring the vibes back to the track with piercing synths and an enrapturing melody as they grab a spot on the package.